General Ebenezer Brewster, whose home occupied the present site of the Inn, founded the Dartmouth Hotel in 1780 but later burned to the ground and was replaced two years later on the same site by the Wheelock Hotel. From 1901 – 1903, Dartmouth College carried out extensive renovations to the facility, which was then renamed the Hanover Inn. An east wing was added in 1924, followed in 1939 by an exterior expansion . In 1968 a west wing was added. Today the Hanover Inn Dartmouth is a charming, 108 room neo-Georgian structure that is owned by Dartmouth College. The Inn is located on the Dartmouth College campus, overlooking the college Green. 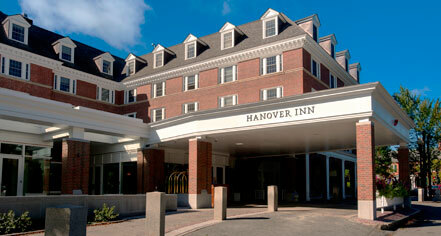 Hanover Inn Dartmouth, a member of Historic Hotels Worldwide since 2014, dates back to 1780. 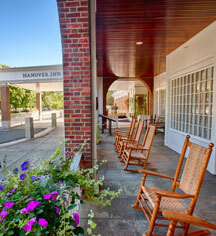 Founded in 1923, the world-famous and scenic Appalachian Trail is at the front steps of the Hanover Inn. Cancellation Policy: 48 hours prior to arrival. Cribs and Pack-in-Plays: Available upon request; surcharge. Deposit: Depends on rate programs booked. Hotel/Resort Fees & Taxes: 9% Occupancy Tax. Parking: Valet parking: $23 per night. RV, bus, truck parking. Pet Policy: Service animals allowed: Yes. Pets allowed. Yes Dogs Only. Fee: Yes. General Ebenezer Brewster, whose home occupied the present site of the Inn, founded the Dartmouth Hotel in 1780 but later burned to the ground and was replaced two years later on the same site by the Wheelock Hotel. From 1901 – 1903, Dartmouth College carried out extensive renovations to the facility, which was then renamed the Hanover Inn. Learn more about the History of Hanover Inn Dartmouth .